Copyright 2011 Australian Institute of International Affairs. The Organisation for Economic Co-operation and Development (OECD) has enjoyed a high profile in world affairs for almost 50 years with its origins dating back to the original Bretton Woods club of institutions. Despite this reputation as one of the world’s most pre-eminent think tanks, policy forums and sources of comparative economic and other policy data, the governance capacity and influence of the OECD remains somewhat ambiguous and contested, often being overshadowed by the triumvirate of the International Monetary Fund (IMF), World Bank and General Agreement on Tariffs and Trade (GATT)/ World Trade Organization (WTO). To use Richard Woodward’s (2009) apt analogy, if there were Oscars for contributions to global governance, the OECD may not have won many lead actor awards, but it would have won a horde of gongs for best support performance. 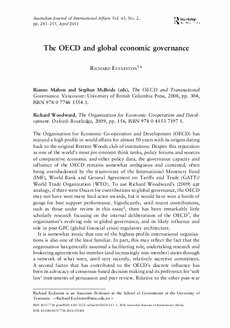 Significantly, until recent contributions, such as those under review in this essay2 , there has been remarkably little scholarly research focusing on the internal deliberations of the OECD3, the organisation’s evolving role in global governance, and its likely influence and role in post-GFC (global financial crisis) regulatory architecture.